I love street food and especially love finding a food truck that serves good Shawarma. This middle eastern dish is very satisfying and one you can eat on the go as the meat (usually lamb or chicken) is served with grilled vegetables, yogurt sauce, and wrapped in Pita bread. On my home cooking “to do” list has been a recipe I found on Food & Wine for Grilled Lamb Shawarma. I modified it for the Big green Egg and made it this weekend with some homemade pita bread. Now sit back, grab a cold glass of French Style Rose, and enjoy this post for Kamado Lamb Shawarma. The secret to getting the deep flavor in the meat is to marinade it for several days before cooking. For this dish I used ground cumin, red pepper flakes, ground cardamom, fresh garlic, lemon, and olive oil. Mix together the ingredients, rub all over the butterflied leg of lamb, place the lamb on a cookie sheet, wrap, and put in the fridge letting it marinade for 3 days. When it comes time to cook, take the lamb out of the fridge and allow to come to room temp, slice a red onion, a yellow, and an orange pepper. Mrs. Buddha has been eager to put her amazing baking skills to use for the blog. Her opportunity came with this recipe for the Traditional Greek Pita I found on another great food blogging site Half Baked Harvest. Mrs. Buddha made the Pita dough and let rise for an hour while the meat came up to room temp. For the pita bread I used my Big Green Egg Mini-Max. I used the ConvEGGerator cooking with indirect heat measured at 400°. On my large Big Green Egg I used the Cat Iron insert to sauté the peppers and onions. Removing the Cast Iron insert, I brought the temp of the Egg up to 400° and cooked the lamb direct until it measured 130° using an instant read thermometer. I sliced the lamb and served it with the peppers, onions, homemade pita, and Yogurt Tahini sauce. 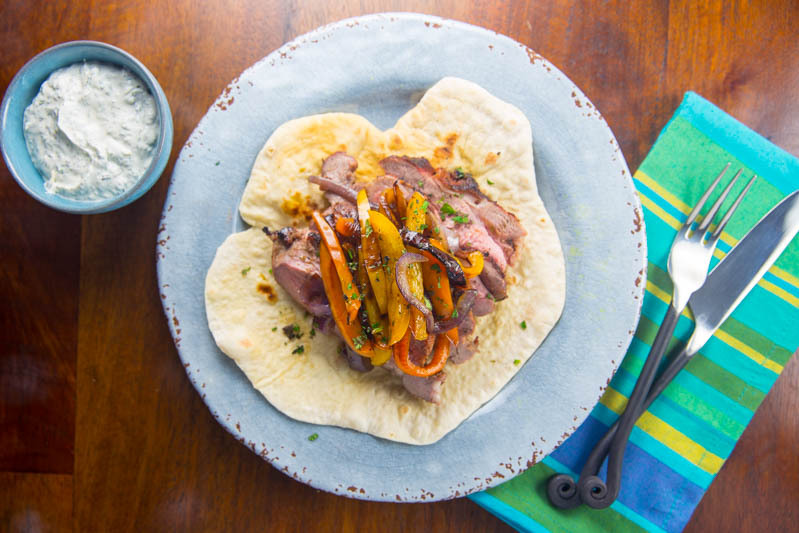 This recipe for Kamado Lamb Shawarma is so delicious. Paired with homemade Pita Bread you this recipe is a keeper! In a small bowl, mix the olive oil with the garlic, lemon juice, cumin, cardamom, red pepper, ½ teaspoon of black pepper and 1 tablespoons of salt. Set the lamb on a baking sheet and rub it with the marinade. Cover and refrigerate for 3 days. Preheat the Big Green Egg to 400°. In a large skillet, heat 1 tablespoon of the olive oil. Add the bell pepper strips, cover and cook over moderately low heat, stirring occasionally, until tender, about 10 minutes. Season the peppers with salt and pepper and transfer them to a serving bowl. Heat the remaining 1 tablespoon of olive oil in the skillet and add the onions. Cook over moderate heat, stirring occasionally, until lightly browned, about 10 minutes. Season the onions with salt and pepper and transfer them to another serving bowl. Keith – this was a great cook. Well worth a try! Lamb is so delicious. I didn’t know you could make your own shawarma so easily. Looks really good! I’m definitely going to try to make this. Wish me luck! Good luck and share the results! Recipe for Yogurt Tahini sauce? Mix 1 cup yogurt, 2 Tbls tahini, 1 minced clove garlic, lemon zest, 2 Tbsp. lemon juice, 1/2 tsp. salt, and 1/4 tsp. pepper in a bowl. Fold in 2 Tbsp. dill and 2 Tbsp. mint. Chill before serving. Mmmm . . . looks even better than one I found on net. Thanks!